The Imperial Valley lies deep in Southern California, tucked up against the Mexican border. It is farm land, where they grow tons of lettuce and thousands of pounds of onions. They grow plenty of melons and truckloads of sugar beets. And one linebacker. One very good linebacker. 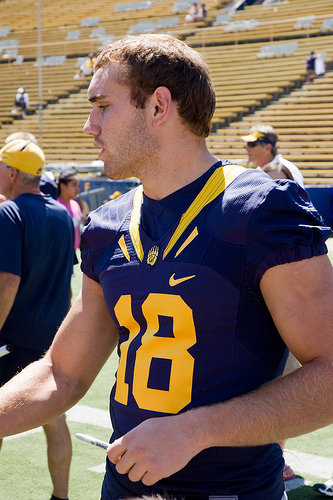 Mike Mohamed, the great-grandson of an immigrant farmer who built a thriving farm in Brawley, has grown to be a 240-pound tackling machine for the California Golden Bears. Niaz Mohamed Sr. was born in India, migrated to America and became a US Citizen. He bought 1,000 acres of the Imperial Valley and began planting. Today, his son Niaz Mohamed Jr., oversees more than 100 employees all of whom likely root for the big Cal linebacker. Niaz Jr. is Mike’s grandfather and still running the family business, a source of great family pride in the valley. Meanwhile, Mike Mohamed is headed for NFL career that is sure to add even more pride to the Mohamed family. He’s already had an impressive college career where among other things was named a four-time Pac-10 All-Academic performer. The goal-oriented Mohameds of Brawley are all over these days. Mike has two cousins, Marty and Kyle, who are starring academically and on the field at Cal Poly San Luis Obispo. Another cousin, Dylan, is headed to West Point this fall. All have been honored by the National Football Foundation as scholar-athletes. And giving is part of the Mohamed nature. After finishing high school at Brawley Union High School Mohamed he decided to attend the University of California. Mohamed played in 50 of 51 possible games and made 26 starts over the years of 2007-10 after redshirting the 2006 campaign. 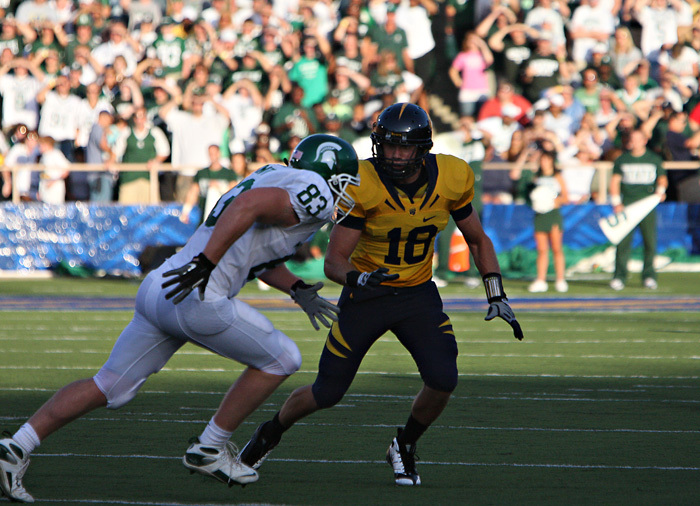 He earned first-team All-Pac-10 honors in his first season as a full-time starter in 2009 after garnering an honorable mention all-conference selection in 2008 and before picking up second-team all-league recognition as a 2010 senior. In 2009, he led the conference with 112 stops (8.6 per game) to earn first-team All-Pac-10 honors and was Cal's MVP on the defensive side of the ball. He finished his collegiate career fourth on Cal's all-time list for tackles with 340 (197 unassisted, 143 assisted), while adding 20.0 tackles for loss (-81 yards), 7.0 sacks (-51 yards), seven interceptions (77 return yards) including two that he brought back for touchdowns, nine pass breakups, four forced fumbles, two fumble recoveries and nine quarterback hurries. He also brought back two kicks for 10 yards. He recorded double digits in tackles 11 times during his career. He made 47 career tackles vs. rival Oregon for an average of 11.75 stops per game in his four contests vs. the Ducks. He was honored on the Pac-10 All-Academic team for four consecutive seasons (2007-10), earning first-team recognition in each of his last three campaigns. 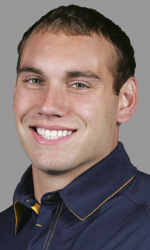 He named Pac-10 Defensive Player of the Week four times, twice as a junior in 2009 and once during both his 2008 sophomore and 2010 senior seasons. 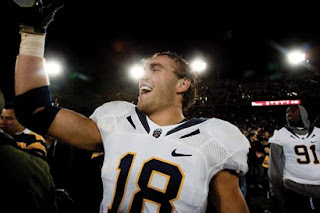 He is responsible for making one of the most memorable plays in the history of Cal football when he secured a 34-28 Cal victory by intercepting Stanford quarterback Andrew Luck on Cal's three-yard line late in the fourth quarter and the Cardinal driving for the go-ahead score in the 2009 Big Game on The Farm. 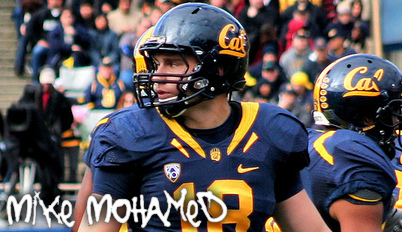 Mohamed played his best football in Cal's biggest game of the year against Oregon with 16 tackles and a sack. He finished 2010 with 95 tackles, five sacks, two fumble recoveries and an interception. He has returned two of his seven career interceptions for touchdowns, with a 19-yard score after a pick vs. UCLA in 2008 and a 41-yard return for a touchdown against Colorado in 2010. The combination of excellence in the classroom and on the field has planted Mohamed on The Lott Trophy Watch List, the award that goes to the top college defensive player who has the biggest IMPACT on his team both on and off the field. Mohamed is majoring in business administration at the Haas School of Business at Berkeley, one of the top undergrad programs in the country. The fact that he is able to balance his academics with his football is a tribute to how he was raised. “I worked in everything from the cooking shed to driving a tractor when I was growing up,” he said. I learned my work ethic on the farm. The hard work there applies to football. Nothing comes easy and it takes a lot of time. He’s also one of the most popular players on the Bears. Named after Pro Football Hall of Fame member, Ronnie Lott, The Lott Trophy is awarded to college football’s Defensive IMPACT Player of the Year. Founded in 2004 by The Pacific Club IMPACT Foundation, The Lott Trophy is the first and only college football award to equally recognize athletic performance and the personal character attributes of the player. The Lott Trophy is given to the player who exhibits the same characteristics Lott embodied during his distinguished career: Integrity, Maturity, Performance, Academics, Community and Tenacity. 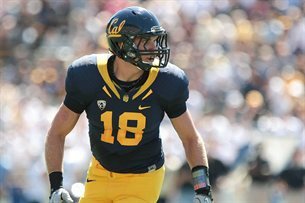 Cal senior linebacker Mike Mohamed was also selected as a recipient of a NFF National Scholar-Athlete Award, the National Football Foundation & College Hall of Fame. Mohamed was one of 16 selected from a nationwide pool of 121 semifinalists from among all NCAA divisions and the NAIA. Each member of the group also becomes a finalist for the prestigious William V. Campbell Trophy. "I am truly excited to be named a finalist for the Campbell Trophy," said Mohamed at the time of announcement. "This is such a great honor and it feels awesome to know that I am being recognized for not only my on the field accolades but for my off the field work, too." 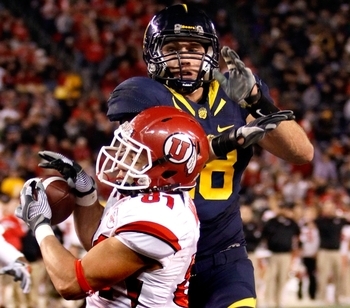 "Mike is well-deserving of being named a finalist," offered Cal head coach Jeff Tedford. "He epitomizes the highest character and positive qualities of a student-athlete. He's a great student, great player, and a great leader. There's no doubt that he deserves this. I know from going to the ceremony when Alex Mack won two years ago, that there were a lot of impressive people there that represented all levels of football. To be one of the people in that group says a lot." Each Campbell Trophy finalist will receive an $18,000 postgraduate scholarship, and one of the 16 will be announced as the recipient of the 21st William V. Campbell Trophy, endowed by HealthSouth, which recognizes an individual as the absolute best scholar-athlete in the nation. Renamed last fall in honor of Bill Campbell, the chairman of Intuit, former player and head coach at Columbia University and the 2004 recipient of the NFF's Gold Medal, the award comes with a 25-pound bronze trophy and a $25,000 post-graduate scholarship. A total distribution of $300,000 in scholarships will be awarded that evening. In the classroom, Mohamed has a cumulative 3.43 grade point average and graduated in December 2010 with a bachelor's degree in business administration. He has been named to the Pac-10 All-Academic team three times, including first-team recognition in each of the last two years. He added District 8 All-Academic first-team honors from CoSIDA/ESPN The Magazine in 2009. In the community, he has been one of the team's leaders and has volunteered extensively for many organizations including The Sage Project, an effort that matches Cal football players with local youth in one-on-one mentorship opportunities. He has also been involved with the Alta-Bates Summit Foundation's 10th Annual Thunder Road Crab Feast, a non-profit fundraiser to benefit under privileged children in the Berkeley area. He was a camp coach at the Calipatria Police Activities League all-skills football camp near his hometown of Brawley, Calif. He has been a volunteer reader at Glenview Elementary School in Oakland, and twice has helped give a local youth a behind the scenes look at the day in the life of a Cal football player. 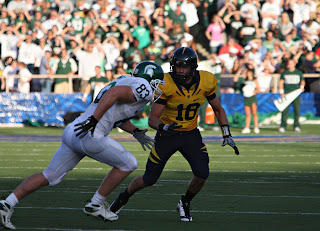 Because Mohamed excelled so much on the field, he has been Cal's most decorated player in 2010. He earned preseason All-American honors from several publications and was also on watch lists for some of the nation's most prestigious awards, including The Lott IMPACT Trophy, Chuck Bednarik Award, Bronko Nagurski Trophy and Rotary Lombardi Award. He was also a candidate for the Lowe's Senior CLASS Award. 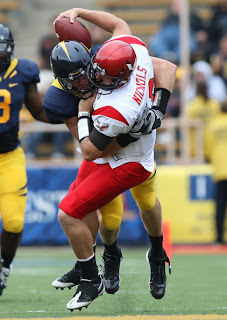 In addition, he was named by Phil Steele as the nation's No. 4 draft eligible inside linebacker prior to the campaign. Three times in his career Mohamed has been named the Pac-10's Defensive Player of the Week. "We are ecstatic about the quality of this year's remarkable National Scholar-Athlete Class. They stand as a testament to our mission of building leaders through football," said NFF President & CEO Steven J. Hatchell. "From top to bottom, this group has established itself as one of the greatest in the 50-plus years of this program, boasting an impressive array of academic and athletic achievements. We look forward to presenting each of them with an $18,000 postgraduate scholarship to further their education, as there are no limits to what these young men will accomplish following their football careers." Scheme and position fit will be important for his NFL prospects. Mohamed projects well in a scheme that requires him to run a lot, rather than engaging offensive linemen. While it's conceivable Mohamed could fit anywhere from inside/middle linebacker to strong safety in the NFL, he projects best as a one-gap type in a 4-3 that expects the outside linebackers to run and cover. Positives: Extremely smart, productive, durable and experienced. Sure tackler with a nose for the ball. Athletic with good "game speed" on the field. Can turn and run with receivers, and projects well covering tight ends in the NFL. Uses his tall frame well and makes plays on the ball in coverage. Top intangibles; very smart in the classroom. Played in a variety of formations, including inside in a 3-4 and at Mike and Will in 4-3 alignments. Actually may project best in the NFL as a 4-3 Sam. Negatives: Somewhat high hipped, and as a result tends to play and run high and upright. Too often tackles by diving at ankles. Not a "thumper." Marginal blitzer who struggles to defeat blocks. Doesn't have a lot of "sand in his pants" and tends to get destroyed when colliding with linemen. Looks like a big safety. May need a scheme like a Tampa-2 that doesn't require a lot of collisions with linemen to succeed. Mike Mohamed was drafted with the 24th pick of the 6th round, 189th overall, by the Denver Broncos in the 2011 NFL draft. LB Mike Mohamed (6/189) figures to battle Nate Irving at middle linebacker but has moved all around in his collegiate 3-4 alignment so it figures that he will secure a backup role. Mohamed isn't a burner but is quick, athletic and smart and racks up tackles. He should be a productive special teams player. As Cal’s inside linebacker, Mike Mohamed had a knack for being around the football. No Cal player had more tackles in the last 16 years than Mohamed, and in the Golden Bears’ best performance last year — a narrow loss to then-No. 1 Oregon — Mohamed had a career-high 16 tackles. He obviously impressed a certain Stanford alumnus who has final say over the Broncos’ football operations. With two other linebackers already selected, and D.J. Williams and Mario Haggan still on the roster and third-rounder Nate Irving poised to take over middle linebacking responsibilities, Mohamed’s immediate future may lie on special teams. This is to be expected for John Fox’s backup linebackers, who in Carolina were often selected on the basis of their ability to contribute on kickoffs and punts; that’s why Joe Mays and Wesley Woodyard may still have long-term futures in Denver even with the team’s run on linebackers. Mohamed also played some outside linebacker at Cal, so he could back up there, as well. Mohamed’s selection means that the Broncos have selected more linebackers this draft than in the five previous drafts combined, when they only picked two, neither of whom plays there now: Spencer Larsen (2008, now a fullback) and Jamie Kirlew (2010, didn’t make it beyond training camp). From 1998-2004, the Broncos picked six linebackers, including four in the first two rounds. This allowed them to put together a corps that by the mid 2000′s was among the league’s fastest and best, with outside linebackers D.J. Williams and Ian Gold flanking Pro Bowler Al Wilson. Since a neck injury brought a premature end to Wilson’s career after the 2006 season, the Broncos have changed to a 3-4 scheme and started 13 different players at linebacker — a group that includes three converted defensive ends: Robert Ayers, Elvis Dumervil and Jason Hunter. All three are back at defensive end in the 4-3 alignment, creating linebacker vacancies that the Broncos spent the last three days filling. For me Mohamed reminds me of another mighty man that we took late that was probably better suited to a 3-4 inside role. That is Spencer Larsen. Mohamed may not lay wood like Larsen but they both are very smart and good football players. This allows them to get over their speed deficiencies and make plays all over the field. I have heard many say that he will probably get cut and be nothing more than camp fodder. But I think Mohamed offers more than that. He provides good depth to the team and will have a big role on special teams. The Broncos should have one of the best ST units in the league this season. Guys like Burton, McBath, Larsen, Woodyard, Mays, Vaughn and with the addition of guys like Carter and Mohamed it will be a unit to be feared. Mohamed will make his bread and butter on ST and may get a chance at a starting role in the future. But for now is reliable as a depth player. ~ Aussie. Thought I would post this up as princess hasn't been around, probably busy. So that is Mike Mohamed for you. Very nice. The last paragraph says it all very well. I am glad we drafted 3 LBs this year. We have neglected the position and Woodyard may leave. Mohamed is much like Woody, IMO, will contribute and be good young backup. I love that he is a working class kind of guy who seems to be willing to put in the hard work needed to succeed. He also sounds like he will give back through volunteer stuff so that's cool. You mentioned Larsen and that got me thinking, the Mohamed pick did pretty much make a statement that Spencer is a FB, not a backup MLB. I personally wish he would go back to MLB. He's not a very good FB, IMO. Yes he will contribute to the team in some capacity, he is a solid player that has a nose for the ball. As for Larsen he is too slow to play MLB in a 4-3, in the 3-4 he was the perfect MLB, but for some reason both Shanny and McD saw him as a FB. As for Larsen at FB he isn't that bad. He has improved greatly over the years and he is still adjusting to the position. I was pleased with his work last year as it was his first full year on a single side of the ball. He is ok as a pass blocker, struggles a little as a lead blocker but he is serviceable. I would also like to see him get more carrys with the ball. As he is a bulldozer when he gets going. But I like him as a FB and I expect a big year for him. I think Larsen is the type of guy you just have to find a spot for and so that's what they did. He's an adequate FB I guess. I just want so much more from that position. Howard Griffith was one of our best FAs ever, IMO. The OL built for Shanny, HG and TD's ability to pop it through the hole fast and break away from the line was a thing of beauty. I'm a huge TD fan and would love to see him in the HOF, but you have to admit he had it fairly easy. When Olandis Gary and Mike/Tatum Bell pretty much did the same thing as TD it kind of gave it away. Man I hope Fox gets us a run game back like that. That and a top 12 D. We would be a contender again. I did a mock on yahoo. Here's my team I got. I think it would be kind of cool to have our draft early this year. Something to do. Like next weekend. Haha that would be good, but there are alot of players without teams that could go in the early rounds that need to be sorted before we can do the draft, so August is a good time, gives as a month and a bit to plan. Larsen is adequate but I would like to see him get more involved, more touches and that. I am a huge TD fan, the difference between Gary and the Bells was that TD got over 2000, so he was a better player than them. I remember a quote from a former Bronco, a teammate of TD I think, that said something like 'TD was never amazing at one thing, he was just great at everything.' TD was one of the most complete backs. Also you should check out the physical similarities between Moreno and TD, it is quite surprising. But like you another back and a good D would be nice. As for the mock draft looks like a real solid team, the Denver DST not the greatest because we are not the most explosive ST and of course not the greatest D at the moment. But I liked all the other guys you got. Though in the real draft I doubt it goes so well haha. the draft looks like a good team, but it looks like there were maybe6-8 teams drafting??? And if not then a bunch of bot-drafting or people who don't know anything. Because MJD and FG would likely never happen in a normal 12 team draft. No it waas a 12 team draft. I agree that it probably wouldn't really happen though. MJD at 6 was because someone went Mendenhall before him and Gore at 19 was because of a run on the top QBs. The biggest steal I thought was Ronnie Brown in the 14th round. You should do one if you're up with baby Jazzy. Haha baby jazzy, nice. I may have a play around with this later. Also anyone heard anything from Pricess, she is MIA haha. Probably getting prepared for the Women's world cup. Baby Jazzy, lol, that's hilarious! I will be down for lots of mocks, as I always am, but I am gonna wait till people are serious about getting ready for the real deal. I know that this early, it is sometimes hard to do a mock without computers filling in by the 6th round or sometimes the draft is half computers and the rest are people. Ronnie in the 14th could be a steal, we will see where he ends up, sounds like miami might let him go. Could go and be featured back some where and could be a sidekick to Chris Johnson for all we know. It's just to early for me personally to be able to strategically do a draft and know that it will help me for the reg season. And just a guess, princess probably is MIA, because she doesn't get into our fantasy discussions. But if you read this Princess, hope all is well and I look forward to your next article, the past few have been great reads! Princess may be busy helping clean up damage from flood waters and tornados in Kansas. I know it's not real doing the mocks now, I just wanted to get a feel for the # 6 posistion. I did 2 now and the first one Dallas Clark lasted to my 5th round pick and the other he didn't. If I use my keeper on him, which you say will cost me a 4th, I know I could just as well just draft him with my 4th and use my keeper elsewhere. However, with 12 other guys using their two keepers, lots of the top players will not even be in our draft that were in those two drafts. Therefore Clark may not be there for my 4th round pick. Decisions, decisions. Yeah Princess could very well be doing that, hope everything is ok over there. As for the mocks and the draft, yes there will be so many decisions to be made. Who knows what will happen. I am happy with my Maclin and Tebow. But unsure of what the rest of the team should look like. But get Clark anyway you can. Hey fantasy footballers, we have 3 more guys from the blogs that we need to get signed back up, knowshonforsure, lets go broncos, and playmaker 7. Do the commish a favor and let them know that they should have emails for re-registration. The last guy, g-squad i still need to get ahold of, he is one of my homies, but let if you see them on any sites find out if they are still game. Also I am gonna start thinking of some new scoring rules, so as always if there are any suggestions let me know. If I see any of these guys I will let them know, maybe post something about it up on the DB.com blog. So what scoring options are you going to go with or thinking? I would post something on there, but I don't really like that site, thats why I come here instead. I stopped blogging on there since they started flagging my posts as spam because of the frequency of my posting. And they are a little too controlling. But as for the scoring, maybe more scoring bonus's, or maybe each team can start one defensive player, that would make it interesting i think. havent givin it much thought, but yeah, we have plenty of time. Yeah same, not a huge fan of there anymore, I still read stuff, but not involved in the conversation much. And defensive players would make it interesting.